significant part of this opportunity. But are CSPs ready to profit from the smart home? Consumers are already interested in connected home services. We asked 26,000 people in 26 countries about their stated buying intentions for the next 12 months. to connect and deliver their smart home. Short on time and keen on convenience, consumers are eager for a single trusted provider that can offer support, security and the convenience of an “out of the box” experience. 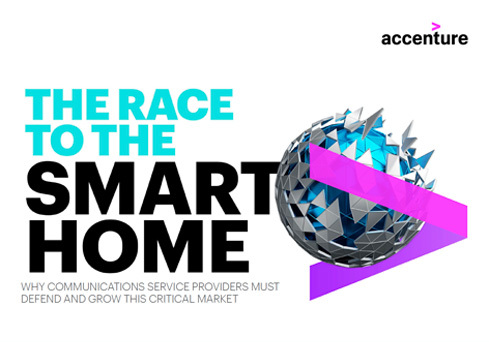 CSPs know that when it comes to connectivity, consumers want devices and services to work seamlessly without having to think about it—and the smart home market will be no different. But players such as Google and Amazon are already chasing the smart home customer through their AI assistants. If CSPs want to win the race, they need to respond quickly. The good news is that CSPs are already established and trusted. The bad news is that it may not be enough to keep their business in the face of poor service or better deals from competitors. We asked: If an alternative mobile provider such as Amazon or Google started offering services comparable with your current mobile services operator, what would likely be your reaction? A worrying 44% would leave. Only 29% would stay because they’re satisfied. Only 6% consider being with an established mobile brand important. 21% stay because they’re bound by contract or indifferent to switch. CSPs already run and secure networks, provide content services such as TV and have established billing relationships. But becoming the preferred provider in the smart home of the future demands a pivot to the new. Disruptors with other business models and technology could make network choice less important. Only by maintaining a healthy core business, finding fuel for growth, then investing in innovative business models and the internal structures to support them will CSPs stay ahead of the pack. Those who build platform-based ecosystems around which new home services can cluster will be the winners in the race to the smart home customer.